Is There Another Motive Behind AT&T’s iPhone Pricing Change? As we note in our Pricing Decisions tutorial, price setting is often a complicated decision and one in which many factors, both internal and external, must be considered. One of the key external factors to consider is the effect of competitors. For instance, how competitors price comparable products may suggest how a company should price its products. But what happens when you are an exclusive provider of a product that is in great demand? Why should you worry about what others are charging if there are no real competitors? For example, as most people are aware, in the U.S. AT&T is the exclusive supplier of the data service for Apple iPhone (Wal-Mart also sells the phone but does not handle the service) and essentially acts as a near-monopolist when it comes to servicing customers who want this product. In many near-monopolistic situations, the company can charge whatever price they want and customers will have to pay if they want to obtain the product. In the cellphone market, however, this is not viewed as a monopoly but as an “exclusive arrangement” where one manufacturer contracts to sell its products through only one data carrier. Despite AT&T being the only carrier, it is also not a monopoly because AT&T is probably not setting their price on their own. Most likely Apple is also involved in pricing the hardware and the required data plan. With this in mind, the decision by AT&T to alter their pricing for customers who purchase an Apple iPhone is quite intriguing and may suggest something bigger. If up to this point in time AT&T and Apple have worked together to set price then this story becomes very interesting and raises the question about the AT&T-Apple relationship. On the surface, AT&T makes the claim that they are changing their data plan pricing to benefit most of its customers who are not major data hogs and will now save $15 month compared to their current data plan. Yet, there may be another reason for the change. 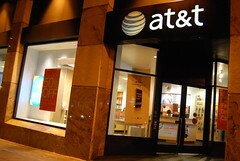 Many believe AT&T will soon see their exclusive deal with Apple end. If so, lowering the price could keep AT&T as the low-cost provider assuming other data providers cannot easily match this price. It could also be a way of using price to lock-in a large number of new customers before competitors can sell the iPhone. At this point, all this is speculation and nothing will really be known until Apple lets the world know their intentions. The fee structure that goes into effect for new subscribers on Monday — the same day Apple Inc. is expected to unveil its new iPhone — will cap use of e-mail, Web browsing, social-network posting and streaming video under two pay plans. Assuming AT&T remains the exclusive provider for the iPhone, ultimately what will it take for this pricing decision to increase revenue for AT&T?